Balrog is Street Fighter V’s One Punch Man. Capable of dishing out an insane amount damage, the fighting game community is divided over the power he has at his disposal, with some writing him off as an overpowered brawler to be nerfed as soon as possible. But does a character who few players are finding success with deserve such scrutiny and stigmatization? 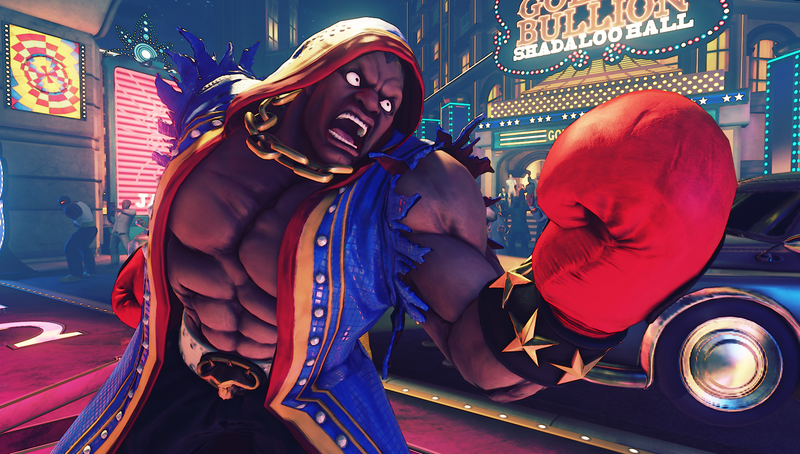 Added to Street Fighter V in June 2016, Balrog has seen little adjustment over a handful of updates. Much of the character’s strength revolves around the Turn-Around Punch (or TAP for short), a move he’s been using since joining the playable cast in Street Fighter II. By holding down two attack buttons, Balrog players can charge the attack through multiple levels, each one more damaging than the last. The final level, accessed by charging the TAP for 56 seconds, unleashes a devastating haymaker that can turn the tide of any battle, no matter how far behind the boxer is in life meter. While charging the TAP takes important buttons away from Balrog in the middle of a match, the versatility of the move has made it ubiquitous in his Street Fighter V gameplay in a way it never was before. Balrog’s big punch isn’t the only thing that makes him controversial. There’s also his V-Trigger mode, which allows him to string together multiple specials for longer combos, and the overall damage he’s capable of dishing out. All of that has made Balrog public enemy #1 in the minds of many Street Fighter V competitors. People don’t like seeing their hard work erased by a couple of hits, and it can be hard to figure out how to counter a character that can erase your entire health bar in mere seconds. Discussion on this topic came to a head back in March after footage surfaced of Hajime “Tokido” Taniguchi, one of the world’s finest fighting game competitors, being absolutely demolished by an online Balrog player despite carefully using Akuma to slowly whittle down the opponent’s life. Although Akuma’s low health was definitely a contributing factor to the quick defeat, it was exactly what detractors were looking for at the time: evidence that Balrog can steal a win he didn’t earn or deserve. Social media has been flooded in the months since with quick clips of Balrog using the tools at his disposal to completely shift the momentum of a match, usually with a lengthy TAP charge. Even so, Balrog has won few major tournaments despite the talented players—namely Bryant “Smug” Huggins, Eduardo “PR Balrog” Perez, Antwan “alucarD” Ortiz, and Brian Foster—who have taken up the cause. Balrog is amazing on paper, sure, but Street Fighter V competition continues to be rather diverse in terms of character selection. As a relatively new addition to the game’s roster, Balrog has only recently started garnering attention from high-level competitors, but the combination of his overwhelming power and the skill of the players who have decided to pick Balrog up have made him a more frequent sight near the end of important events..
Smug agrees that Balrog is a really strong character, but also believes that his own play can make the boxer look stronger than he actually is. Similar to how he utilized gentleman pugilist Dudley in Street Fighter IV, Smug squeezes as much damage as he can out of every interaction with the opponent. The key to fighting Balrog, he said, is to be patient. Arias believes that Balrog suffers when it comes to defense, which also explains why he might not be as popular as Ibuki, another strong character who’s seen a ton of attention after the recent season two update. Balrog players have to focus on that big damage because, for the most part, it’s all he has. If you knock the boxer down, there’s very little he can do. Sometimes, however, no amount of fortitude can spare you from the Balrog onslaught. A high-level player named Christopher “NYChrisG” Gonzalez knows this all too well. During a recent episode of ESL’s King of the Hill series, which sees competitors fly to Burbank, California every week to represent their various home regions, ChrisG came face to face with Brian “Brian_F” Foster. Although known as a promising Balrog player with strong tournament showings across the United States, Brian came into ESL as the underdog, even after defeating first opponent Ted “NORESPECT” Sarmiento by a score of 10-1. Chris, an Evo champion, facing a mid-level player from Florida? No contest. What followed was one of the most exciting Street Fighter V sets since its release. Brian, taking a few pointers from his previous opponent, showed Chris zero respect. He took three quick games, forcing Chris to switch from Urien to Ibuki in an attempt to stop the bleeding. After a few more matches, the score stood at 8-1 in Brian’s favor, and it looked as if he had the match sealed up before Chris mounted an insane comeback to tie the games at nine apiece. As things came down to the final game, Balrog’s overwhelming offense became too much for Chris to contend with, and Brian walked away with a narrow victory. Chris immediately stood from his chair and threw his hands up in defeat. His shaking head told the entire frustrating story long before he joined the commentary desk for his salty, post-match interview. This attitude may also contribute to the lack of a large group of Balrog players. Arias feels that the negativity surrounding the character means we won’t see another strong player join the four who are already making waves for some time. Since his addition to Street Fighter V in season one, Balrog has seen few significant adjustments, and has in fact gotten stronger in many cases. While it’s clear that he isn’t the monster some folks make him out to be, it’s only a matter of time before Smug, PR Balrog, alucarD, or Brian_F find themselves in the grand finals of another major event. They’ll just have to suffer a few rolling eyes and heavy sighs as they march towards victory.